All I can say is To Kill a Kingdom deserves your attention and love. Honestly, I was never a big fan of Ariel and the Little Mermaid. When I think of Disney princesses, she’s one of the last ones to come to mind. So, imagine my surprise when I read the blurb and go, Ohhhhh, Ariel has turned dark and I like it. 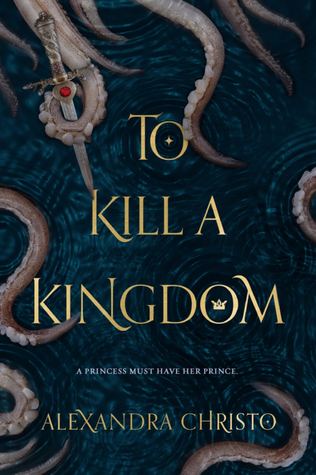 To Kill a Kingdom is the story of Lira, a siren princess that lives to kill princes and steal their hearts to prove to her Sea Queen mother than she’s strong and powerful and cruel enough to take her place when time comes; and Elian, a human prince who lives to kill sirens. You know where this is getting, right? Lira is a badass siren, but she shows a link to her humanity from the start, and it comes in the form of her also siren cousin. Elian is also a badass, and his charm is partially due to his respect and friendship with his crew of pirates. “I HAVE A HEART for every year I’ve been alive. The first third of the story is full of heart-stealing (literally and not) and siren-stabbing scenes, and bad attitude and good humor and “OMG, I’m already falling hard for this book” screams from me. Then, we move on to what the curse. Not a spoiler since the blurb gives it away. Also, this is a retelling, so Lira will obviously become a human at some point. So, yeah, the evil Sea Queen curses Lira and gives her legs and a human appearance so she has to steal Elian’s heart without her powers, or say goodbye to her siren form and probably her life. I’ll say this, the Sea Queen isn’t joking around. She’s evil and she won’t spare anyone, family or not. So Lira has a reason to be scared and to have turned into the killer she is. But humans aren’t always trash (despite what our current global situation implies), and Elian and his crew have a chance to change Lira’s mind about humans even though they have zero idea she’s a siren. As for Elian, rescuing a drowning, naked Lira also ends up being a chance to end a war without having to kill the entire siren species. Since he also doesn’t that’s a real possibility, he spends his time searching for a magical item that will kill the Sea Queen and her daughter. So here we have these two beings that are planning on killing each other, but end up stuck together and I’m obviously loving all of it. The banter is incredible from the start. The humor is there, although I’m not sure everyone will appreciate it. I did. The characters are amazing! I loved, loved Madrid and Kye, two members of Elian’s crew. I LOOOOVED how Madrid was so eager to have another female pirate on the crew that she welcome Lira with open arms. I loved how Kye was protective of Elian and made sure Lira knew he was keeping an eye on her. I love how Madrid and Kye were together in a healthy, no-drama-needed relationship. I loved that Kye was protective of Elian, but he didn’t suffocate Madrid. I loved when all of that interacted and joked and teased and made me laugh. Dude, this book made me laugh. I can’t even with the world building. I CAN’T. It’s just so amazing. All the countries/kingdoms we visited with Elian and Lira were so rich and unique. I’m still OBSESSED with the love country that sounded like a chocolate-filled heaven. I want it!!! The freaking romance!!! Five words: Slow Burn + Hate to Love. They were perfect together and that last scene was the end of me. I’m just dead. Seriously, that entire last chapter was perfect because it gave me everything I needed. First, my happy ending, thank you very much. Second, my ship being adorable on a literal ship. Third, an ending that showed me a powerful female main character who followed her destiny, an equally happy male main character who found a way to fulfill his dream and the two of them engaged in a healthy relationship that survives distance and is built in mutual respect for each other’s responsibilities and dreams. And a real ending. No cliffhanger, no need for sequels. A freaking standalone. When was the last time I read a YA Fantasy standalone that had a perfect ending that left me wanting to read more, but also knowing that maybe I shouldn’t because it’s already perfect? I can’t remember. Now that you read this long and rambly review, go show this book some love, PLEASE!